Cinderella clearly knew the value of a good pair of slippers and I submit for consideration that in itself is reason enough to go shopping for a new pair of shoes! This delightful image from SheepSki Designs inspired me. For their FB challenge, they want us to use two colors so I chose pink and silver. This is fabulous! I love these shoes! I hope you are keeping well. OH! I want those shoes! (wouldn't be able to walk in them, but I want them LOL). Fabulous with the pink Connie and love the sentiment. Great pair of shoes on your pretty card, but I must admit I prefer my sneakers!! What a fun way to use the pearls, gorgeous card, thanks so much for sharing at Allsorts challenge this week! Beautiful! Love it! Thank you so much for entering our ATG challenge at Crafter's Castle this week. We hope to see you next time too! A lovely feminine creation in pretty pinks, many thanks for joining in with our 'Use Pearls' theme at Allsorts challenge. Cinderella would LOVE this shoe and it really is a beauty - but I'd have to have the ambulance on stand-by if I wore them now. Too used to wearing sneakers and flip flops the last few years. LOL! I love your card though and all the pink is so pretty. A perfect bow too! The silver pearls dressed up the shoe just right. 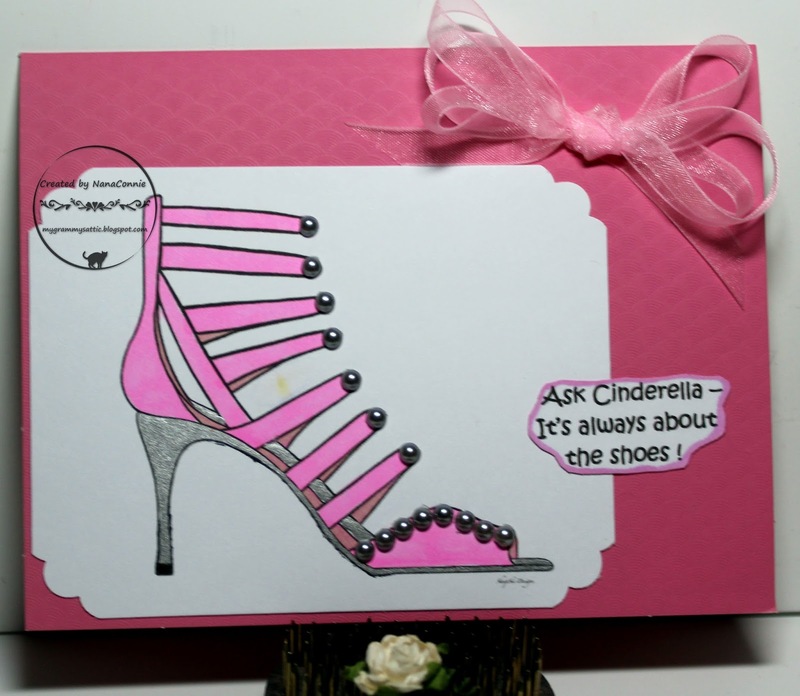 Fabulous card love the shoe.